Summary : There isn't really that much to say about this tea. It's unflavored. It's unscented. It is...basically...just a very pleasant "straight" Japanese Sencha Green Tea that tastes great and slides down smoothly. Review : I've been reviewing lots of exotically flavored and infused teas recently. So, with nothing better to do at 12:30 am on a Thursday morning, I figured it was time to try a "straight tea", or a tea that simply is tea leaves and nothing more. No flavors. No infusion. No flowers. Just tea. And so the search through the collection of teas I have began. The first that met my needs was Culinary Teas Japanese Sencha Green Tea. So, I ripped open the light-proof, vacumn sealed bag that all their sampler teas come packaged in and gave this tea a try. My first impression of this tea was a good one. Basically, the tea had a moderately strong fragrance of...you guess it...sencha green tea leaves. Indeed, I would have been disappointed if it had been anything else. 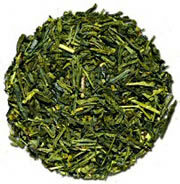 Here is how Culinary Teas describes this tea : "A good value, pan-fired Sencha green tea from Shizuoka prefecture. Our most popular Japanese green tea that is light in color but rich and full in cup." The description provided on their website is perfectly accurate. The tea leaves are light green. The taste of the tea is very light..and happily...without any bitterness. But yet, this tea does have a pretty powerful flavor to it. Exactly what the "full in cup" means I have no idea, so I won't even go there. Overall, this is a high quality and tasty pure sencha green tea. For those who enoy "straight" green teas, and sencha green teas in particular, definitely head on over to Culinary Teasand give this tea a try. That said, people who have never drank green tea before may prefer one that has been "infused" with some flavorings, such as a Mint Green Tea. Recommendation : Yes. Unless you are new to drinking gree tea (if so, try Culinary Teas Mint Green Tea), you will definitely like this tea. This is especially so if you hate anything added into a green tea. Brewing Instructions : Use 1 teaspoon of tea leaves per cup. Pour water with a temperature of 180 degrees over leaves. Let brew for 3 minutes. The leaves in this tea are powerful enough that you can use them 1-2 additional times, although do expect some flavor loss if you do this.